A nice, hearty, gaspipe typeface. A definitive bold condensed sans influenced by neo-grotesque designs. A relatively low stroke contrast complimented with sharp, horizontal stroke ends lend an unyielding appearance, while it’s rounded forms and refined curves juxtapose its inherent strength with grace. A contemporary grotesk, inspired by years of working as a graphic designer and the constant need for sans serifs with a flexible voice and durable performance. A sans serif with rounded terminals, its simple, neutral feeling, is functional, clean and minimal. Rounded terminals make it friendly and warm. Consists of letterforms with large x-heights, wide, bracketed hairline serifs, and slightly angled stress. Its italics have crisp yet painterly undertones that suitably contrast with its upright counterparts. A clear and simple sans serif typeface. 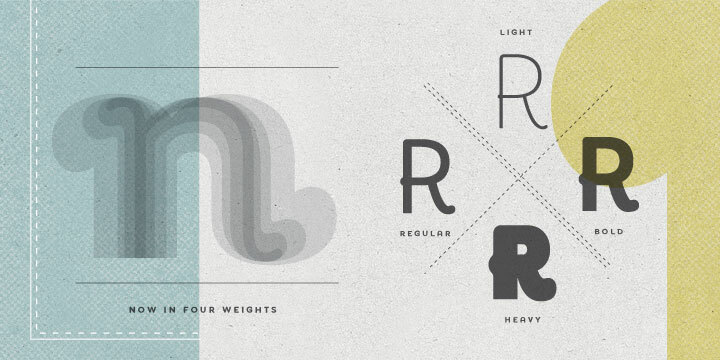 Straight lines are combined with precision curves to form a functional and versatile typeface. Designed upon a proportional structure which makes it surprisingly legible even in very small text sizes. A cheerful band of letters that bounce across the page and get together to create words in four weights. Quirky without being too whimsical. A pair of typefaces that contains four variations of uppercase letterforms, inspired by the playfulness of arranging individual wood type letters. A typeface with 4 stylistic sets: geometric, modern, grotesk. Inspired by old wood types from the classic western-movies. A calligraphy font based on calligraphic style called Copperplate. A simple geometric, monoline framework allows for stylistic consistency over three variations. A typeface completely designed with the sole function of being used on eReader devices. Designed by combining many different elements on legibility theory and how the eye reads. The latest addition to the popular Graublau type family designed by the Berlin-based type designer Georg Seifert. Finely balanced weight distribution and open shapes make JAF Bernini Sans a great text face, while the wide variety of weights and widths provide a rich toolbox for headings and display typography. Conceived by writing out variations of each character by hand using a roller pen before the scanning and digitising process. A hyper-display didone; a true magazine header of extraordinary charisma. Designed to contain and communicate a distinct creative expressiveness. Showing both distinct elegance and boldness while optimized for higher legibility. The Metro family was originally designed for the Metro of Copenhagen. A restrained bohemian vibe that seems particularly appropriate for a coffee house or an art gallery. A five weight, high-contrast sans serif display family. A sans serif typeface with a technical and geometric appearance. The family includes 9 weights with matching italics. Its large x-height makes it especially legible at small point sizes. Available in 3 cuts: filled, holes and parts. Also, it’s the third month we’ve partnered with Type Release, so check out July’s list and June’s list!